Having travelled to Thailand, I know that this dish is by no means authentic. But it certainly adds a whole new set of flavours and textures that may brighten up a boring supper routine. While this dish uses some convenience items, it still offers a host of nutrients and fibre. 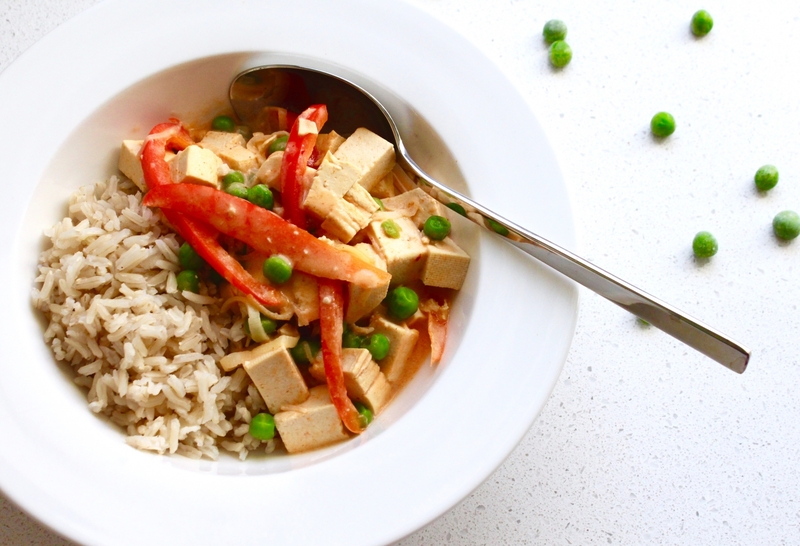 If you're new to cooking with tofu, you will find that it takes on the flavour you are cooking with. If you wish, you can cut back the tofu by half. Otherwise, you might substitute tofu for a chicken breast. 4 cups cooked brown rice (put this on right away since brown rice will take ~40 minutes to cook. Otherwise, you can use instant brown rice). 1) In a large saucepan or wok, heat the coconut oil and saute the garlic, onion, and tofu cubes a few minutes. 2) Add the peas and red pepper and saute another minute more. 3) Add the coconut milk and stir well, turning the heat up slightly. 4) Stir in the ginger, curry paste, cayenne pepper, salt, and sugar. 5) Bring to a boil for just a moment then reduce heat to a simmer until the rice is cooked. Serve in a bowl.